The Appalachian Trail runs from Georgia to Maine and is 2,190 miles long, and takes anywhere from five to seven months to hike the entire trail. Known as thru hikers, these brave souls begin at Springer Mountain in Georgia and end at Mt. Katahdin in Maine. The junction of Winding Stair Gap and Hwy. 74 tempts hikers to hitch a ride 11 miles down to the Town of Franklin, a perfect resupply point. Hikers say that if you haven’t made it to Franklin by mid April, you probably won’t be able to complete the entire trail. The idea of the Appalachian Trail came about in 1921. The trail was completed in 1937, although improvements and changes even now are continuous. Earl Shaffer was the first hiker to report a thru-hike, walking the entire trail in 1948 from Georgia to Maine. Since then an estimated 12,000 people have hiked the full length of the Appalachian Trail. The trail is maintained by volunteers. Last year 6,200 people led by members of 31 official Appalachian Trail maintaining clubs, worked 210,000 hours repairing trails, painting blazes, and maintaining shelters, privies and wells. The conservancy is staffed by 44 paid workers year round and 12-15 seasonal workers. Hiker-feeds are places where people from nearby towns set up supply tents to help aid hikers with food and other essentials. Since hikers can only carry a limited amount of supplies in their backpack, they must replenish often. Gear can weigh as much as 50 lbs., and carrying such weight up steep hills takes a toll on even the most seasoned hiker. Often hikers do not know where and when they will be able to obtain supplies. Many say they will just figure it out as they go. 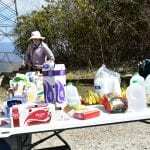 One such hiker-feed was found on Tellico Road where the Appalachian Trail crosses. First United Methodist Church of Franklin (FUMC) set up a booth this past Sunday, and were offering sandwiches, fruit, beverages and first aid supplies to those hikers crossing the trail. It is a winding, steep, unpaved road that takes you to the spot, about 11 miles from town, where the trail crosses Tellico Road. Associate Pastor Vickie Lawrence and her youth group were busy greeting hikers as they made their way through the trail. Alexis Kaminski was one of the hikers who was grateful for the food. She had injured her knee early in her hike and now needed a brace to keep going. She was carrying a backpack that weighed 28 lbs. and now with her knee injured, she and her hiking partner Attila Vamos had to slow down. Attila and Alexis had been in town the day before and were pleased to find how cordial and nice the residents of Franklin were. Alexis explained that they would hike about 10 miles per day, beginning at 9 a.m., and then set up camp for the night. They cover about two miles per hour but may have to slow down a bit with Alexis’s bad knee. 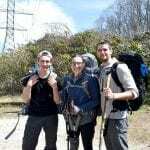 Alexis was recently the recipient of some “Trail Magic.” A “Trail Angel” (people who wait for hikers to cross a road) had noticed Alexis’s knee brace and the hiker just handed over her walking sticks to help Alexis continue her journey. The hiker was not going for a thru-hike so she felt that giving away her walking sticks would be a way to put them to better use. Gleasner was also very grateful for the food and supplies. Many young people pursue the long trek but some older folks were found tackling the trail also. Steve and Cheryl M. were a couple from Boynton Beach, Fla., who had decided to take on the Appalachian Trail. 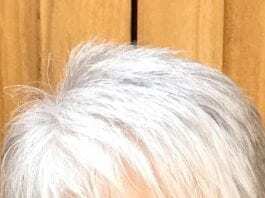 Since they decided to take an early retirement, they have been traveling by camper and hiking short distances to prepare for this arduous journey. Steve and Cheryl have been married for 36 years and both feel that this hike was “an event of a lifetime.” Also grateful to happen upon this hiker-feed, they were both enjoying the food and the relaxation, if only for a short while. Steve was carrying a 40-pound backpack and Cheryl’s was just a bit lighter. They were hopeful of making the entire journey and had no idea how or when they would be able to replenish or how they would even get back home from Maine. “We have 1900 miles to figure it out,” said Steve. “Charley has been helping hikers since she was born,” said her father. 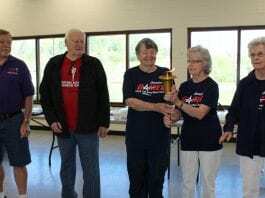 FUMC has been aiding hikers for 10 years. 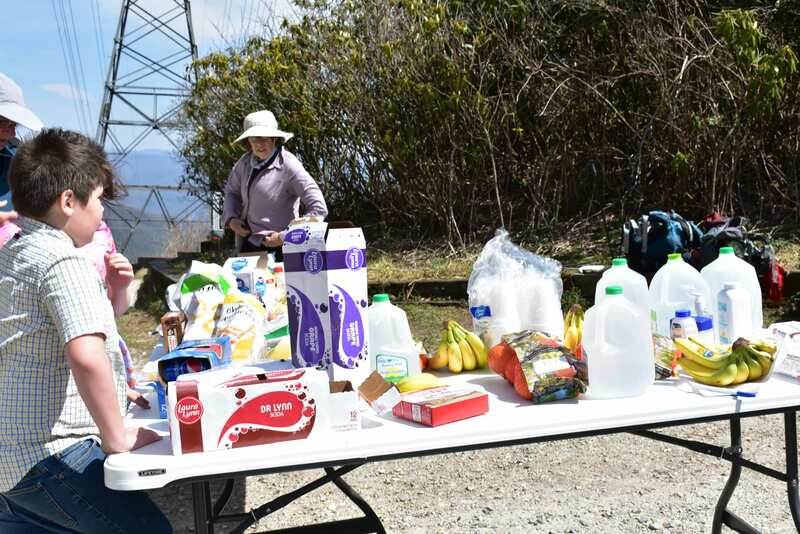 Other hiker-feeds, such as at Franklin First Baptist Church, offer free breakfast daily for hikers, from mid-March through mid-April. The church shuttle bus picks up the hikers at their motel, feeds them breakfast, offers up some prayer and inspiration, and shuttles the hikers back to their motel to resume their trek. 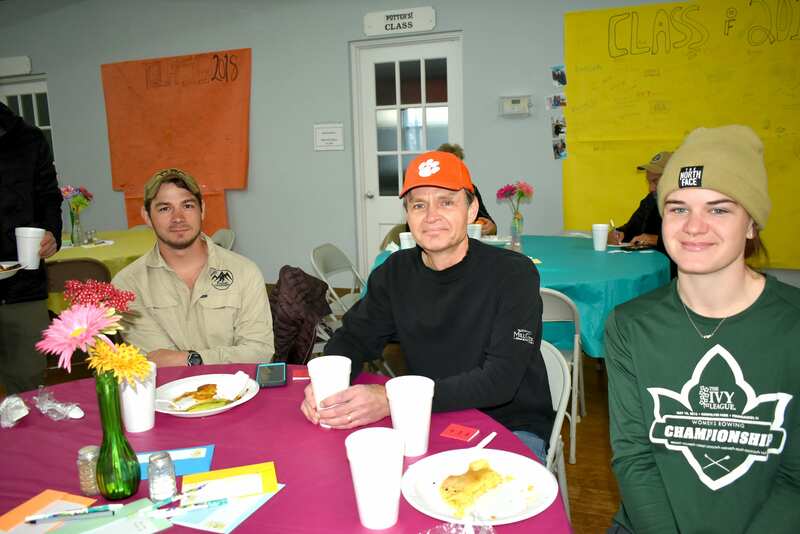 At First Baptist Church, volunteers were cooking up some hot cakes and bacon along with coffee, hot cocoa and orange juice. 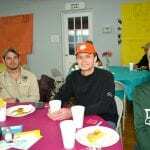 Twenty or 30 hikers participated in the free breakfast opportunity last Saturday. Coordinator Patsy Parker along with Pastor Robert Brown spoke to the hikers and offered words of encouragement and prayer for their long endeavor. Sun was another hiker taking part in the breakfast, who came from Guangzhou in South China to hike the Appalachian Trail. Although he could not speak English he was able to use his phone to spell out his name and home town. This was his first time attempting such a long hike. 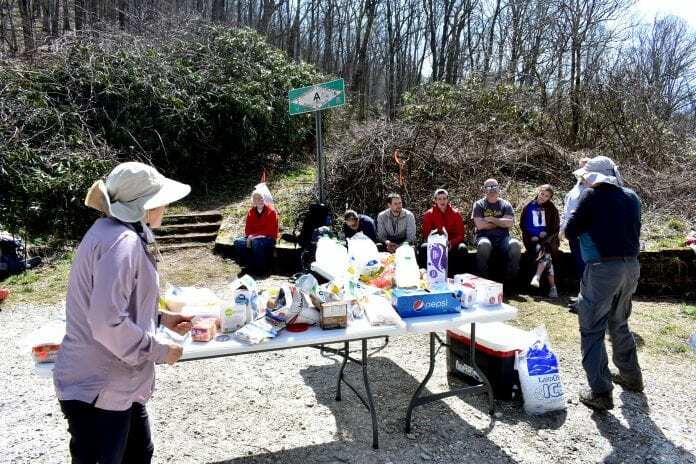 The volunteers who had whipped up such a delicious breakfast remarked that the hikers looked forward to this event and to the pit stop here in Franklin. 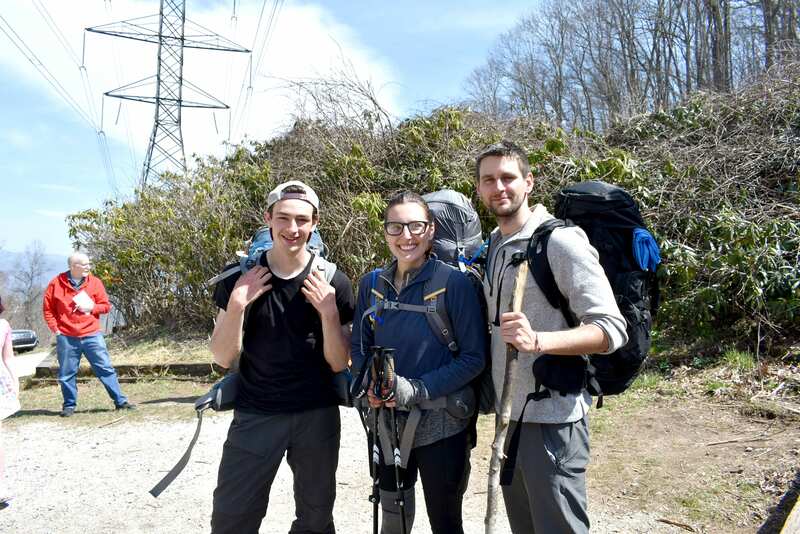 Tommy Smith, one of the volunteers said that, “it is like planting seeds for these hikers, they all look forward to it.” Craig Miles is the Associate Pastor and a former hiker. “It is a mission” he said. This is the 12th year that First Baptist has offered free breakfast for the hikers. North Carolina boasts 95.7 miles of the AT and the elevation range is between 1,725 and 5,498 feet. The trail continues through 14 states including Georgia, Tennessee, North Carolina, Virginia, West Virginia, Maryland, Pennsylvania, New Jersey, New York, Connecticut, Massachusetts, Vermont, New Hampshire, and Main. 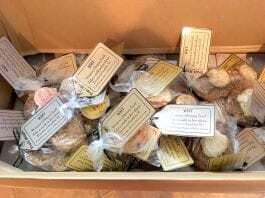 Many other states offer hiker-feeds and “Trail Angels” are found throughout the 2,190 miles of trail. Until Oct. 15, Mt. Katahdin is staffed by forest rangers. After that date, the ranger stations close for the winter rendering hikers unable to get immediate help if needed. Most hikers have a goal set to get to Maine by Oct. 15 but there are times when the hike can go beyond that date. The trail is open 24/7 but the prime hiking dates are from mid-March to mid-October.